If you want something unique for your house, then you can try to use primitive home décor since not many people use this theme in their house. But you should not worry because actually by using this kind of theme, your house will feel more comfortable because primitive style actually make your house feel warm. Some people were afraid if they use this style it will make their house look old and not interesting, but that is not the case if you know which items to use and how to use it. Primitive design can also make your house appear unique and beautiful. You might already know this material since it is a favorite for primitive home décor material. That is why you must also try to use this material inside your house. Try to find some accessories or other items that made using burlap material and use it in your house. Some suggested items are windows treatment, lamp shade, pillow case, wreath, pocket wall decoration, bed skirt and many others. Burlap has nice texture which is why when you use this material as accessories, and then it will also add more texture on your design thus will make it rich and deep. This item is the main primitive home décor signature that you should use in your house. However some of you might be afraid to use this item as it is too colorful and unique thus make it hard to use. However you can actually use this in your bedroom since you can easily find quilts bedding. This bedding will not make you feel too much since the bed should be the center or attention inside your bedroom. Furthermore with the beautiful pattern and color that quilts have, it will surely become point of interest inside your room. 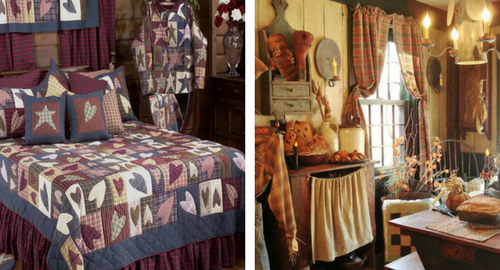 Another must have primitive home décor accessories that you could use around your house. Of course you can use different kinds of lighting since there are many primitive shapes that you can find. That way you will have variation of lighting all over the house to make each room unique. For your ceiling you can try to use mesh lamp shade. Or you can put desk lamp in your library. Lantern lamp is also great for lighting, and you can put them all around your house. And if you want to work with candle then you can find beautiful holder or try to use with there are also some candle that operated with battery. Dolls are other favorite items for primitive home décor that you should have. Moreover dolls in primitive style are unique since their design is very much different from our modern dolls. They are traditionally made by the mothers on the house for their children or for decoration. Thus the mother made them from scrap cloth or rag which they have after they made clothing for their children. But now those dolls are made using new cloth specially provided for the doll, but they still made using primitive style to not lose the traditional essence. These items also consider as a way for mother to express themselves thus make them a form or art. Moreover the dolls are often changed based on the current season or event so it is very interesting to see each design. Accessories made with primitive style are unique so not everyone might like this style. But if you truly like this style, then you could see the beauty that it can bring into your house. Furthermore you can also mix them with items and furniture that you found in your parent or grandparent house. This will surely add more personal feeling to your design. You will also able to use old items that can still be function today thus you do not need to get rid of them and get a new one. You can also try to make a few accessories yourself since primitive home décor are originate from mother handmade items. Of course you can also find them on home decoration store if you do not want to make it yourself since they are equally beautiful.